DIME Thread Color Conversion Software, Free Monthly Designs from Brother iBroidery.com, 21 Exquisite Stabilizer Samples for Testing, Designs in Machine Embroidery Magazine Offer. Iris high sheen 100% polyester embroidery thread is designed to create machine embroidery as well as decorative sewing. Polyester retains it's color, heat resistance and strength. All 61 exclusive Brother palette colors are included in this set as well as a useful and decorative wooden thread rack that can stand on your sewing counter or can be hung on the wall for greater utility and space saving. 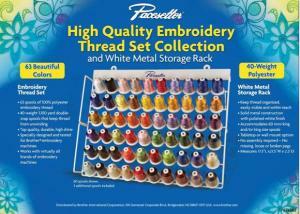 Pacesetter embroidery thread is color keyed to the Brother Embroidery Cards giving you just the right color for each design. Madeira 20928060 Incredible Threadable Glamour Metallic Embroidery Thread Kit 40 Spools x220Yd 12wt Heavy Weight +2x1650Yd Bobbin Threads & More! Robison Anton 1100Yd x All 453 Colors, Poly Embroidery Machine Thread 40wt, Wood Racks, RA Thread Made in the USA!